Free professional bipolar mood chart online here!
. . . and start this easy and effective self-help program now. Charting puts you in the driver’s seat so you can safely participate in your own psychological care. What is a mood chart? It is a simple, patient driven tool that requires only a few minutes a day to complete. However, mood charts are extremely powerful and effective. Bipolar mood charts provide a visual image of how important pieces of information such as mood, medication, and life events all fit together. 1. Date: there should be space for recording data for each day. a range of points above the baseline for elevated mood, and below the baseline for depressed mood. A scale of -3 to +3 is common, but some charts have scales of -5 to +5 or even -10 to +10. I like to use -3 to +3. 3. How much sleep the person got. An online bipolar mood chart is a great tool. 4. What medication was taken and the dosage. 5. Notes: this an be a record of life events considered relevant, such as stressors, therapy sessions, family gatherings, or notes about the workplace. Some people also track their weight – for me this has been essential for helping me maintain physical health as well. Other items that many people like to record along with weight are any alcohol or drug use. Women often also include their menstrual cycle. Someone who is experimenting with making diet and exercise changes may especially like to include that information. I particularly like versions that include columns for recording anxiety and irritability levels as both of these are issues for me. 2. Identify your personal triggers for episodes. 3. Recognize your own individual early warning signs and symptoms. 4. Discover health strategies that work for YOU. 5. Take firm control of YOUR mental health! One I like is Optimism because it makes it easy to recognize early warning signs and avoid relapse (and you can download it free). The wonderful thing about mood charting is that the exact contents can be customized for each person. Why keep a mood chart? OBJECTIVE EVIDENCE: I may suspect my fish oil is doing me good, or that my new medication is not as helpful as good old fashioned lithium, but I prefer collecting empirical data over a period of time to base my decisions on. PRE-EMPTIVE STRIKES: My bipolar mood chart provides an early warning system that shows when my mood is becoming unstable. This makes it possible to make changes before I am caught in the middle of a major mood episode. SELF AWARENESS: For me it is helpful to be aware of how I am feeling and of any ups and downs. It gives me a sense of control and makes me more sensitive to how my condition may be effecting my loved ones. EVIDENCE WHEN FILING FOR SOCIAL SECURITY DISABILITY: A very useful part of your medical evidence, it can show exactly how your mood swings interfere with daily living. Each of the versions included here comes with instructions. All you need to do is download a free copy of the blank mood chart and then print it and make as many photocopies as you need. Samples of completed charts are also included to help you understand the process and get started. These particular bipolar charts have been chosen because they are professional versions that have been tested and validated, and are used and recognized by leading clinicians and researchers. Just choose the one that you like best. 1. NIMH Daily Mood Chart from the National Institute of Mental Health. 2. Black Dog Institute Mood Chart. Sharing charts for bipolar disorder with significant others, family, friends, therapists or medical professionals, or anyone else you consider part of your support network may be extremely helpful. 1. Sometimes others are able to pick up patterns that I miss. 2. I want my partner to feel informed, involved and trusted. 3. Sometimes my symptoms show up as an inclination to be secretive, paranoid and controlling – sharing my chart is the most effective way for me to short circuit this. 4. Knowledge is power, and I like power to be shared! 5. 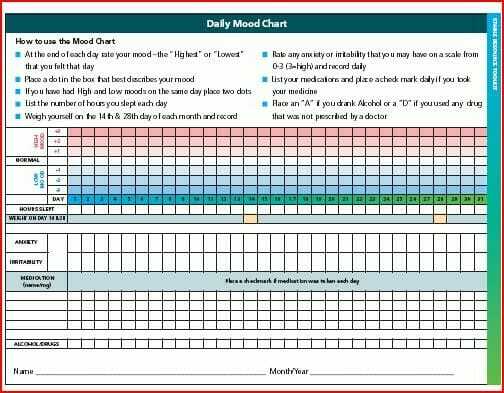 The information from your mood chart is needed to create an effective Wellness Plan that is personalized for YOUR bipolar disorder and for your Bipolar Treatment Contract, giving you and your loved ones an important safety net. Bottom line . . .
By it’s very nature, the course of bipolar disorder is bumpy and unpredictable, with its mania, interludes of relative peace, and the hell of bipolar depression. The whole point is that both the disorder and responses to treatment are likely to follow an irregular pattern that can be very confusing for the bipolar person and their care-givers. We use a mood chart daily and I have a few questions. Firstly, is there a online tool to help with analyzing the data? ie. stats or graph charts? Second question, would the time of the day the data was taken matter? I noticed that this chart has no area to tell when the observation was taken, is there a reason for this? Sadly, bipolar is surrounded by myths & distortions. This site contains accurate, genuine, evidence-based facts: the truth. You can turn your life around and improve your condition by following some straightforward, practical steps. © Bipolar Lives 2007-2019 bipolar-lives.com ALL RIGHTS RESERVED. This site does not provide medical advice, diagnosis or treatment. See additional information. Weight gain after bipolar medication? 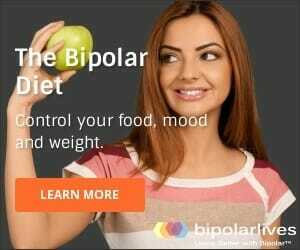 Read The Bipolar Diet & balance your moods and weight gain.Read The Bipolar Diet & balance your moods and weight gain.